Outlook PST Repair software to repair corrupt PST files. The Outlook PST file repair tool is a comprehensive software to repair and recover the corrupt Outlook PST file mailbox items. It restores all the database stored in the Outlook PST such as emails, calendars, contacts, events, to-do lists, journals etc. It acts as a lifesaver tool as it not only repairs the corrupted data but also recovers the deleted mails and other inbox items. Recovers entire inbox contents such as Email, contacts, notes, journals, contacts etc. from the corrupted Outlook PST file. 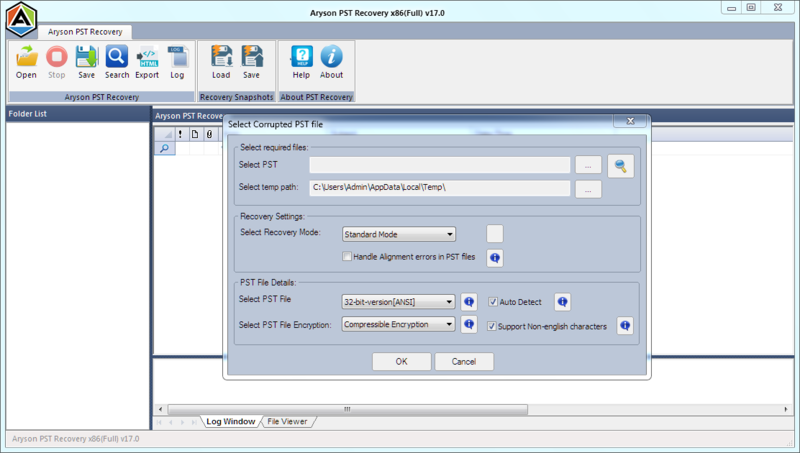 Supports the recovery of Encrypted PST Files. No sorts of limitations on the PST file size for the recovery. Output PST files can be saved to other file formats such as MBOX, DBX, MSG and EML. The PST Recovery Software allows to export Outlook mailbox to Windows Live Mail and Mac mail. Any specific email message can be located from any PST file using search feature. 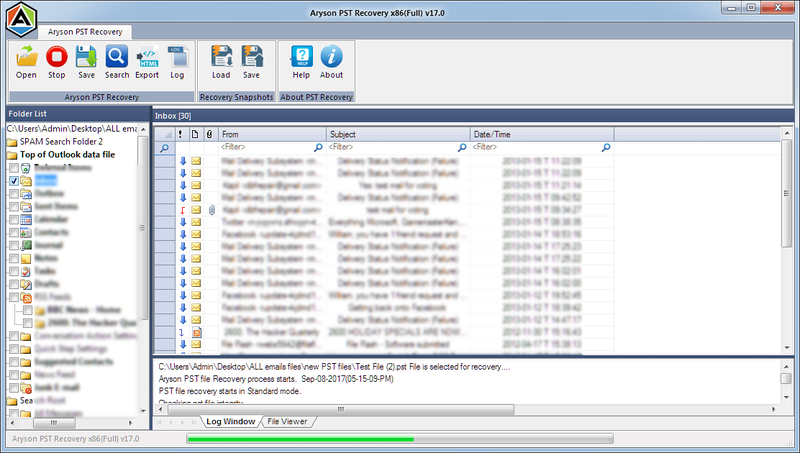 The free PST file recovery tool facilitates the users to preview the emails and mailbox contents. Recovers the deleted attachments and messages. Compatibility with all the versions of Outlook including Outlook 2016, 2013, 2010. 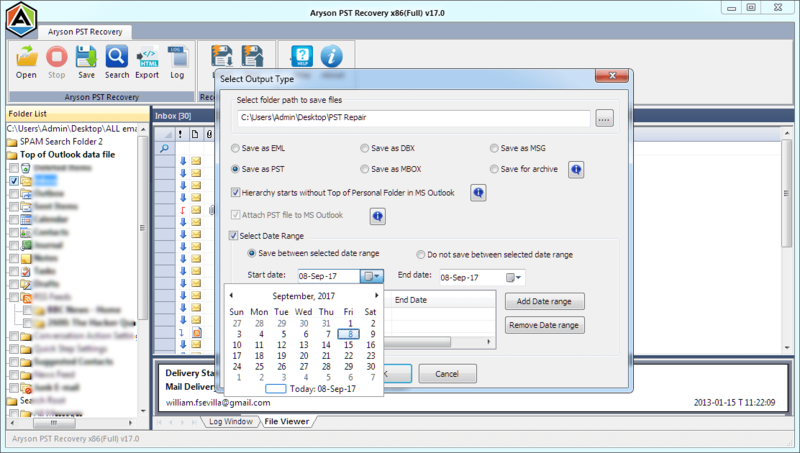 The Outlook Repair Tool is one of the most prominent solutions to fix the corrupted PST files even if these files are encrypted. It has a strong algorithm to restore all the mailbox items like calendars, emails, events, contacts, journals etc. Using this Outlook Recovery Tool, a user can add new PST files on their Outlook accounts. For doing this, users just need to mark the checkbox of Attach PST file option before the saving process. Users can add single as well as multiple PST files in the MS Outlook using advanced features. The Outlook PST Recovery tool can recover all the inbox data from the corrupted or damaged PST files and save it to several other file formats apart from PST such as MSG, MBOX, DBX and EML. Users are asked to select the file format in which they wish to save the resultant file after the recovery. There are multiple recovery modes in this software. The first one being the Standard mode, which fixes the minor corruptions in the Outlook PST file. Advanced mode is for moderate level of corruption. Last being the Deep mode of recovery in which the severely affected files are repaired and the maximum possible data is restored. The tool has a feature that supports the recovery of Non-English characters present in the Outlook PST file. Users must click on the check box of Support Non-English Characters before the scanning starts. The UNICODE characters from the corrupt PST file can be recovered. This feature is equipped to all the three modes of recovery, i.e., Standard, Advanced, and Deep. If your PST file is fed up with media corruption or any other corruption related to header alignment, simply check the 'Handle Alignment errors' option in the PST files box. PST file corruption occurs mainly due to large-sized or heavy mailbox contents. MsOutlookHelp repair tool for Outlook PST helps to resolve all the issues and offers complete PST Recovery solution. 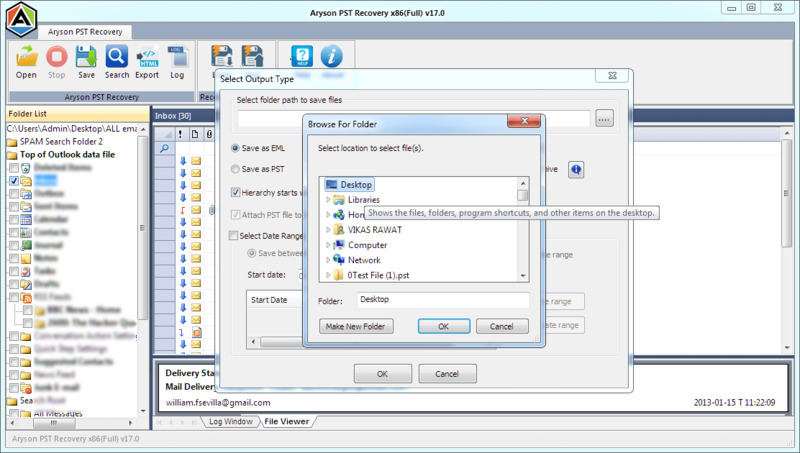 This Outlook recovery tool is featured with Auto-Detect option, users can easily find out the version of Outlook PST file, type of encryption (if any) and the file format from the UNICODE or ANSI. The Outlook PST recovery software repairs the corrupt PST files irrespective of the extent of corruption and the file size. Users can fix the corrupt file of any file size. There is no sorts of limitations on that. Using this Outlook Repair Tool, you can save the entire PST recovery snapshot at a specified location. This feature can save your valuable time when you need to scan your PST file in future. 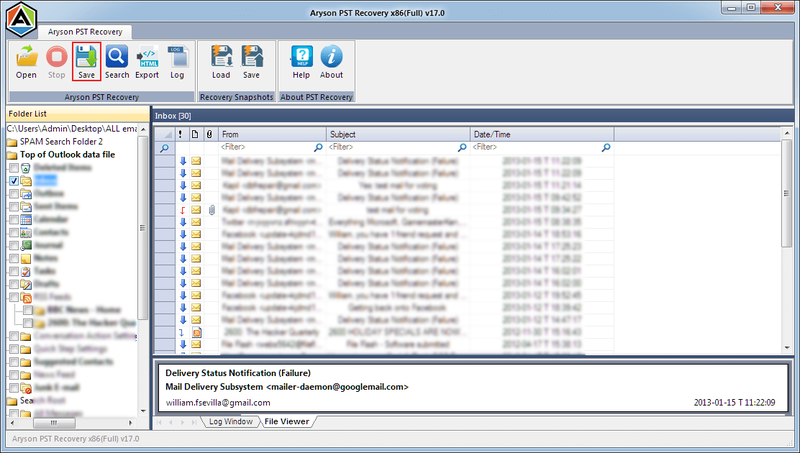 This tool has a feature using which users can save only the selected emails that they wish to restore after the recovery process. It maintains the entire process of recovery in a hierarchy of folders. The interface of the tool is so interactive that any user can operate it with ease. There is no requirement for any technical expertise. Even a naive user can successfully recover the data using this Outlook PST Repair Tool. It runs the ANSI and UNICODE PST files created by all the versions of Outlook without any hassle. Also, it is widely compatible with all the versions of Windows operating system including the latest Windows 10. Step 1: Download and run the Outlook PST Repair . Click on Open in the menu bar and then on browse button to select the OST file. Step 2: Select the OST file you wish to convert to PST. Further, click on Open button to confirm the same. Step 3: Choose the scanning mode among Standard, Advanced and Deep depending upon the severity of corruption. Step 4: Now, define the other details of OST file and choose the options accordingly. Click OK to start the scanning. Step 5: In a short time span, scanning process will be completed. Hit a click on OK. Step 6: You can now preview the entire mailbox contents. Select the items you want to save and click on save in the menu bar. Step 7: Now, click on Browse to specify a location for saving the resultant file. Step 8: Define a location eg. Desktop and click OK.
Step9 : Select the Date range saving option box and other options accordingly. Click OK to start the conversion process. Step 10: The conversion of OST to PST is in process. You need to wait until it gets completed. Step 11: Once the process gets completed. Click OK to exit the application.
" Very user-friendly software. Also their support team is excellent. Great work by the developer. " 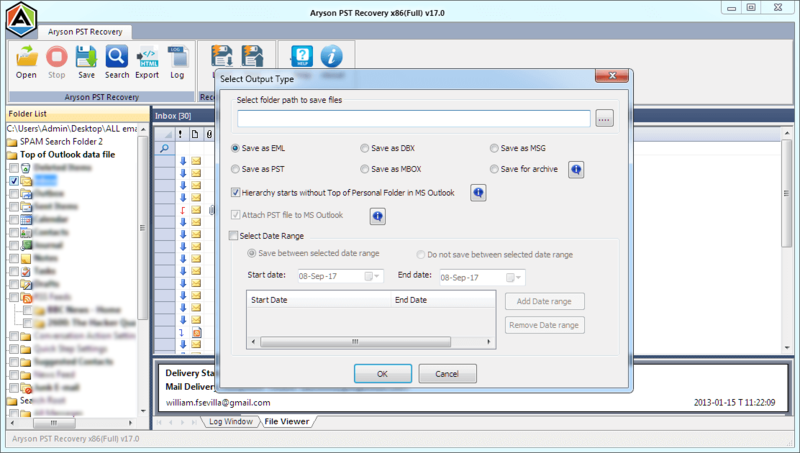 "This PST repair tool helped me to save my PST files. It was very efficient and reliable. Overall, it was a great software." 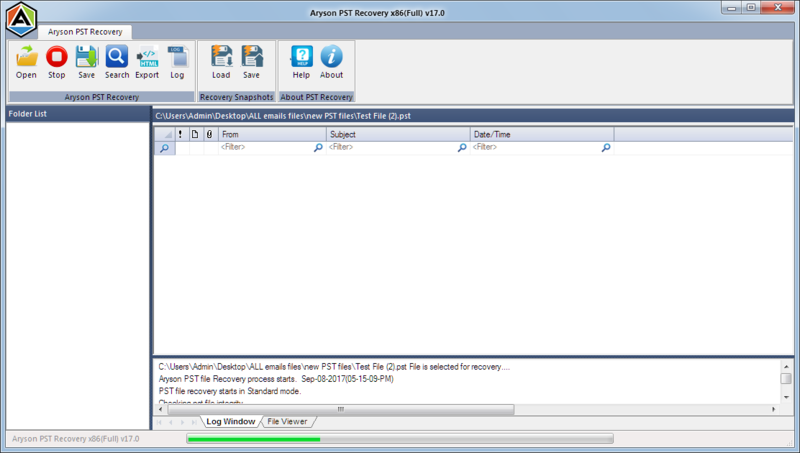 "I’ll recommend this PST recovery software to everyone who faces the problem of corrupt Outlook PST file. It helped me to repair my large sized PST files. " How can I repair the corrupt PST file using the Outlook repair tool? Launch the Outlook PST Repair tool. Browse the PST file you wish to repair. Choose the mode of scanning among Standard, Deep and Advanced. Later, select the versions from the 32 or 64 bit and proceed with OK button. Preview the contents of the PST file. 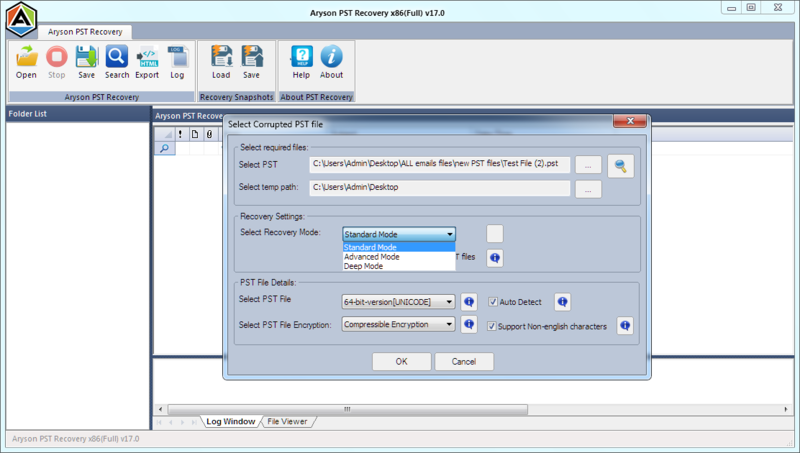 Save the recovered file into PST or some other file format at a specified location. Can I retrieve the deleted emails in the corrupted PST? 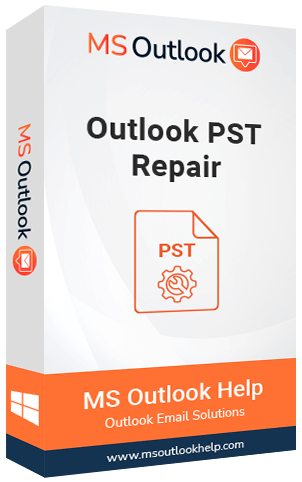 Yes, you can definitely recover the deleted emails and other contents after repairing the corrupt Outlook PST using the Outlook PST repair tool. Is there any sort of limitations on the file size that needs to be repaired? No, PST Repair Tool does not apply any restrictions regarding the file size. You can repair the file of any size. Is there any option to search a particular file if I am not able to locate it? Yes, the software is equipped with a Search feature so that you can find any file in a particular volume. Later, select the file and proceed with the same. 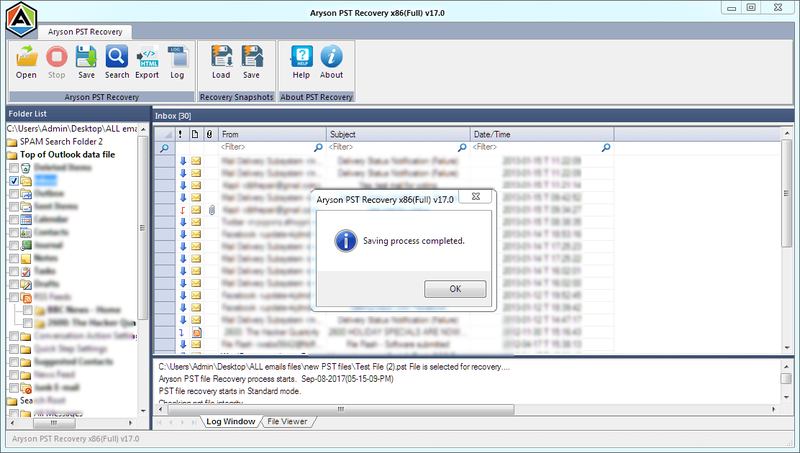 Can I save the resultant PST file after repair using the demo version of the software? Using the free version of Outlook repair software, you can preview the recovered data but can’t save it. For saving the output file, you need to purchase the Full version. Is this software able to recover all the damaged data in the PST file? In my view, there is not any software that can provide 100% recovery of the deleted and corrupted data. 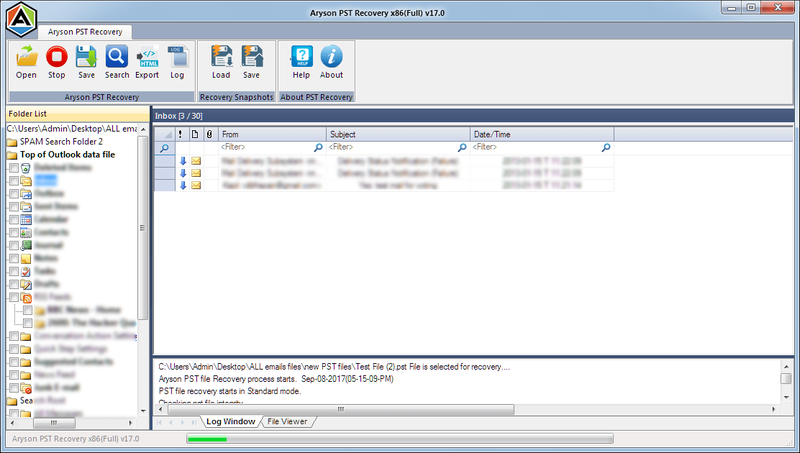 However, this Outlook PST Recovery Tool recovers the maximum possible data from the PST file. What are the licenses offered by this software? The Outlook Email Recovery software offers the license for single users, businesses, enterprises and corporations. It provides the single as well as multiple license for both technicians and administrators. What are the file formats apart from PST in which the resultant files can be saved? Using PST repair tool, you can recover the corrupted data from the PST and can save it to several other file formats such as MSG, MBOX, EML, DBX etc. apart from PST. 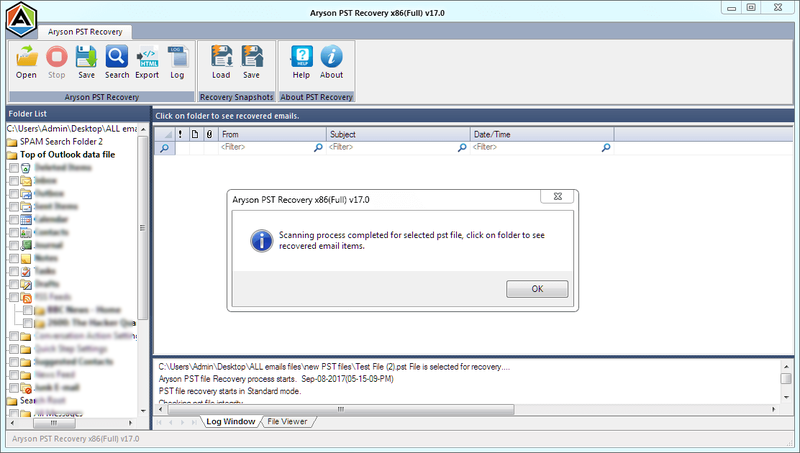 Is there any facility to recover ANSI format file of PST using the software? Yes, you can recover the UNICODE as well as ANSI format PST files in the Outlook Recovery software. Is the software compatible with the latest WIndows and Outlook versions? Yes, the PST repair tool supports all the versions of Outlook including Outlook 2016 and is highly compatible with all the versions of Windows OS including the Windows 10. Outlook version: MS Outlook 2016/2013/2010/2007/2003/2002/2000/98/97. Launch the software as "Run as Administrator" if using Windows 10/8.1/8/7 or Vista to get a better result.